Tree roots are very powerful, even small, newly forming roots. Because they are driven to find more sources of water and nutrients, tree roots constantly extend themselves in the search. What happens as a result of these movements depends on the kind of soil the tree is planted in. Soil that consists of loose dirt and rocks tends to shift and become displaced, which allows roots to move through it easily. It’s very useful to know which type of soil your home sits on because that should tell you the kind of damage that tree roots may have in store for your residence. One way to address the issue is to install a root barrier around young trees at a depth of 18-24 inches in a trench around the root zone. In order to do so, you may have to dig all the way down to the base of your home’s foundation. You can cut away roots that are approaching your foundation while you’re digging for the barrier. Stump grinding is another option; however you can also drill holes in the stump and cover it with soil or fill them with a stump decay accelerator. If you’re determined to plant a new tree in your yard, another way to subvert the threat of root damage is to select a slow-growing tree species that has less aggressive rooting tendencies. Steer clear of willows, silver maples and elm trees that spread deep and insidious roots, and go for the oak or sugar maple trees that grow slower. If you can’t provide adequate space for the tree’s roots, then you should think about trying something smaller or a different landscaping option altogether. Having an insufficiently deep foundation. This is why homes with full basements are far less vulnerable to root damage and concrete settling than older homes built on shallow foundations. Those shallow foundations are far more vulnerable to tree roots because of dried-out soil conditions and shifts. 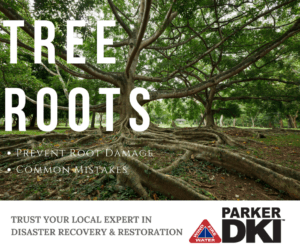 Failing to have an analysis of your soil type and foundation status is ill-advised when it comes to dealing with tree roots, failing to do so can cause problems in the future by having intrusive unwanted tree roots to deal with. The repair costs from invasive tree roots can add up. Homeowners should learn how to control invasive roots to avoid and minimize these problems, but tree removal is often the most practical answer, freshly cut stumps treated right away with glyphosate will usually kill the roots. In the end, the best method to prevent tree root problems is prevention and proper tree selection and location.